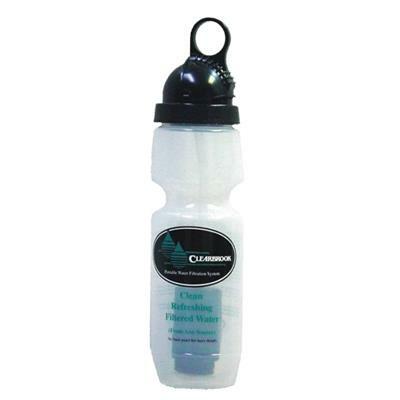 Emergency water filtration bottle that reduces 99.9% of all 4 types of contamination. Produces potable water from virtually any source. This Water Filtration Bottle is a portable water filtration system that provides clean and refreshing filtered water from virtually any source. The self-contained revolutionary filter produces 100 gallons of 600 refills of great tasting, pure drinking water. This portable water filtration system is capable of up to 99.9% reduction in All 4 Areas of Contamination: 1) Aesthetics - removes offensive tastes, odors, silt, sand, and sediment, 2) Micro Biologic Pathogens - removes Cryptosporidium, Giardia, and other cysts and spores. Chemical, 3) removes Industrial VOC's, PCB's, Agricultural SOC's, detergents, and pesticides, 4) removes Heavy Metals, Aluminum, Cadmium, Chromium, Copper, Lead, Mercury, and Radon 222. Meets strictest EPA, ANSI, & NSF 42 and 53 standards and protocol. Unbreakable, lightweight, 22 oz. (1 liter) bottle fits easily in a backpack or on your desk. The "No Leak" top, with collapsible / pop-up straw can easily be used as a squeeze bottle or used conventionally by drinking through the straw. Used and tested by International Red Cross, U.S. Olympic Team, U.S. Coast Guard, and California State approved laboratories. Color of bottle may vary. Why do you need emergency water purification supplies? Following a disaster, there may not be any safe drinking water available. When the electricity goes out, water treatment plants may stop working causing tap water to become unsafe for consumption. Emergency responders may not be able to deliver water to your area safely. And, it may not be safe or possible to boil water due to broken gas lines. So, you need to be self-reliant by having emergency water purification supplies. Dimensions: (1) Bottle: 2.75 x 2.75 x 11" - Case (20): 24 x 18 x 13" - Pallet (430): 48 x 40 x 80"
Provides clean and safe drinking water from any virtually any source of water. Removes and reduces: offensive tastes, odors, chlorine, silt, sediment, harmful microscopic Pathogens such as e-Coli, Cryptosporidium, Giardia, and other bacteria, Radon 222, Aluminum, Cadmium, Chromium, Copper, Lead, Mercury, etc. Filter has been tested by the University of Arizona and by Spectrum Labs in accordance with the EPA Protocol for Microbiological Purifiers and ANSI/NSF 53 adapted for sport bottles. Squeeze bottle for filtered water.